What are Tooth Scaling and Root Planing? When you go to the dentist for your twice-yearly cleaning appointment, you expect to have your teeth poked, prodded and polished, and to be reminded to floss more and brush regularly. What you may not normally hear is that your dentist recommends tooth scaling and root planing. You might be concerned about what this means for you. What is Tooth Scaling and Root Planing? Scaling and root planing are the measures taken to fight more severe cases of periodontitis, also known as gum disease. Dental scaling goes beyond a normal dental cleaning to help remove excessive plaque buildup that can lead to gingivitis or periodontitis, otherwise known as gum disease. Using thin dental instruments like a dental scaler and curette or an ultrasonic cleaning device, the dentist reaches below the gumline to carefully clear out excess plaque. This is also known as a deep cleaning. Tooth planing is when the dentist reaches deeper below the gums—to the tooth’s root. 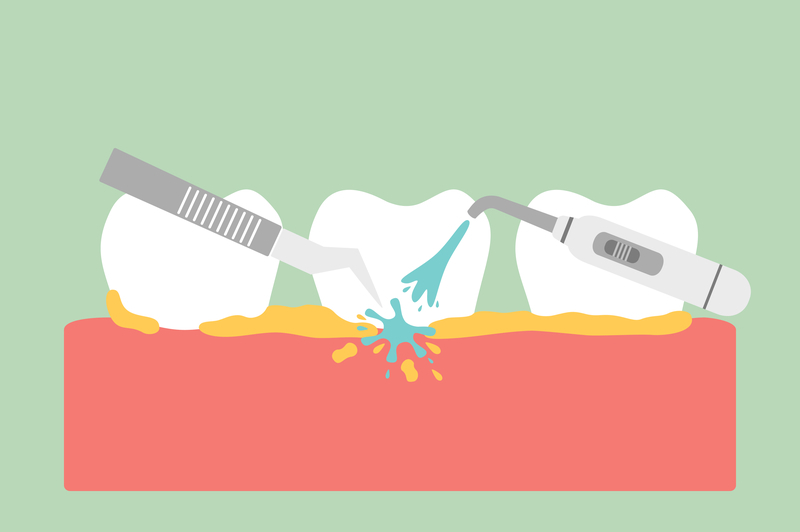 This procedure smooths the root surface to enable the gums to reattach properly. Why Do I Need Tooth Scaling and Root Planing? Periodontitis causes gums to recede, allowing pockets to form between the gum and tooth. These hollows can then be filled with bacteria, causing infections that not only hurt but actually break down the connective tissue and bones that keep teeth firmly in position. If not remedied, periodontitis can lead to tooth loss, as teeth are no longer securely held in place. How Did I Get Periodontitis? Periodontitis is caused by bacterial growth in the mouth, usually brought on by plaque buildup. In its early stages, patients typically are diagnosed with gingivitis, which manifests as gum inflammation. At this stage, gums may feel tender and might bleed when brushing and flossing. A dentist might tell someone with gingivitis they need to be more aggressive in their oral care. If they are, gingivitis can quickly clear up without any lasting damage. Left untreated, however, gingivitis will worsen, leading to periodontitis. While most people recognize poor oral hygiene as a cause of gum disease, there are a few other factors that lead to bacteria setting up shop in your mouth. These include certain medications and illnesses, life changes such as pregnancy or hormonal shifts, and negative habits, like smoking or high-sugar diets. Barring these causes, you may simply have a family history of gum disease that makes you more susceptible to getting it. According to one study, roughly one half of Americans experience some level of gum disease. Some dentists will treat the entire mouth for periodontitis at once; others will break the procedure into a few appointments, taking care of one half or one quarter of the teeth at a time. To make the procedure more comfortable, the dentist will numb the gums surrounding whichever portion of the mouth is being treated. He or she will then use either the hand-held or ultrasonic tools to gently scrape away (scaling) buildup from gum pockets. Once all deposits are removed, the dentist will smooth out the tooth’s roots if there are any rough patches (planing). This will allow gums to adhere back to the tooth. After scaling and root planing, you can expect your mouth to be a little sore once the numbness wears off. Your gums may even be swollen and bleed a bit, possibly for a week or so. Depending on the severity, your dentist will either prescribe medication or have already inserted medication directly into the gum while cleaning it out to further help fight any potential infection. A follow-up appointment will determine if the procedure was successful, or if more work is necessary. Your dentist will most likely recommend more attentiveness to your at-home dental cleaning routine. Ask your dentist for tips on how to combat future gum disease. To keep your mouth healthy and happy, maintain regular dental appointments with Advanced Family Dentistry. Like any dental issue, the sooner gum disease is caught, the easier it is to treat. However, for advanced cases of periodontitis, you may need to be referred to a periodontist. At Advanced Family Dentistry, we pride ourselves on keeping up with dental education so that we can provide the best family dental services to our clients. If you are looking for a family dentist in Reston or the Northern Virginia area, we invite you to make our practice your new dental home. Contact us today to schedule an appointment. Dr. Sonny Kim is a Diplomat of the International Congress of Oral Implantologists (ICOI), the highest education level for general dentists in this field.